Once upon a time, when The Legal Genealogist was a very small girl,1 the Hot New Toy for the Christmas season was a particularly frilly baby doll. Blue eyes, short blond curls, frilly baby clothes, the works. That was the year when I didn’t care much what all I got for Christmas … as long as one package, any one package, contained that doll. And that was the year when my mother didn’t get the Sears order in anywhere near early enough and, by the time she ordered, the doll that was left — the doll that ended up in my stack of gifts — was a Raggedy Ann. Now don’t get me wrong. In a family the size of mine, any gift is a good gift. And a Raggedy Ann is a very fine doll, one that at another time perhaps would have been loved and treasured. But to my five- or six-year-old self, it was a bitter disappointment. That pretty much sums up my personal reaction to the new AncestryDNA Ethnicity Estimates that were rolled out to the first group of customers on Thursday. Me… I got Raggedy Ann. Unlike many AncestryDNA customers who thought their old ethnicity estimates were way off, I thought my old ones were probably pretty close, except for what I thought was a high estimate of Scandinavian since I have no known Scandinavian ancestry. They seemed to reflect pretty well my 50% German ancestry from my father and my mother’s more mixed but largely British and Scots-Irish (not Irish, mind you, but Scots-Irish, which isn’t Irish at all) heritage. So… okay… where did my Germans go? And where did all those blankety-blank-blank Scandinavians come from? And why, oh why, is everybody else getting ethnicity estimates that more closely approximate their known ancestry — and I’m getting estimates that are farther away from mine? Why does National Geographic’s Geno 2.0 say the population I most closely resemble in today’s world is the German population — and AncestryDNA shows me with just a trace amount of DNA from what it now calls Europe West (Belgium, France, Germany, Netherlands, Switzerland, Luxembourg, Liechtenstein)? Why does 23andMe report much higher percentages of French and German, and much lower percentages of Scandinavian, no matter which level of analysis I look at there? And beyond the German-or-Scandinavian results issue, why does 23andMe say it can detect trace amounts of Sub-Saharan African in my ancestry — and AncestryDNA says the African it’s picking up is from the Saharan region (called Africa North: Morocco, Western Sahara, Algeria, Libya)? Now I’ve carefully read the Ethnicity Estimate White Paper dated 4 September 2013 that AncestryDNA offers to its customers who see the new results.3 It explains, carefully and in detail, how each of our DNA samples is compared to those of what are called reference populations: groups of people from specific geographic areas whose pedigree establishes that their great grandparents, grandparents and parents were also from those specific geographic areas. So why — given the fact that I know darned good and well that these are (a) estimates, (b) estimates based on comparisons not to actual historical populations but rather to small groups of people living today, (c) estimates based on comparisons not to actual historical populations but rather to small groups of people living today and based purely on the statistical odds that those small groups tell us something meaningful about past populations — why am I disappointed? This may be a perfectly good set of results. Maybe all of my Bremen ancestors (documented back many generations thanks to civil registration and church records) actually descend from a pocket of displaced Hanseatic League sailors from Stockholm or Bergen.4 Maybe a bunch of the British and Scots ancestors in my tree descend from invading Vikings. The problem is… we don’t know what these statistical analyses of our genes today are really telling us about our ancestors who lived so many years ago — decades, generations, perhaps millennia in the past. Maybe we’ll never know. Particularly for those of us with nearly 100% European ancestry, comparing ourselves as living beings today against other living beings today may never tell us with certainty what we’d like it to tell us. What I want, of course, is a road map to every part of my genome: this part is English, this part Scots, that batch over there German and that part French. What I want is for all my DNA results from all the companies to agree with generally conforming percentages rather than being, literally, all over the map. What I want is for the science to be there, right now, today (yesterday would have been better) to take all the uncertainty out of this. What I want is the baby doll. And, once again, what I got was Raggedy Ann. I’m still waiting to receive my revised ethnicity results, and I shall be interested to see what I find. However, I was amused to discover that, according to Ancestry, Britain is no longer part of Europe! I suspect there’s a fair number of folks who wish it wasn’t, Debbie! But keep in mind: this is playing to a largely US audience meaning lots of folks who want to know English versus Irish versus all those continental types. The results can only be as good as the reference populations… and that’s where the problem likely lies. um…those results don’t indicate that GB is not a part of Europe. It shows Europe and then two subcategories: GB and Scandanavia. What are you even talking about? Um… you might want to read the piece again, and then maybe again. The issue is the inability of AncestryDNA to detect what it’s now calling Europe West (Belgium, France, Germany, Netherlands, Switzerland, Luxembourg, Liechtenstein). Not Europe overall, but Europe West. If you look at the chart on the left, you see that AncestryDNA previously detected 43% of my genome from Central Europe — presumably my paternal German ancestors — and 50% from Great Britain and Scandinavia — presumably my maternal Scots-Irish ancestors. The newer results, on the right, have the Central European segment disappearing almost completely. It took me 3 times to get my results, and of course they kept sending me free ones until it was official. I was surprised at the results! Great summary, Judy. Throw in the various sadmixture results at Gedmatch and the whole DNA ethnicity “industry” seems almost like palm reading. I know it’ll get better. Looking forward to seeing my (and my mother’s ) AncestryDNA results. Right now, she has way more Scandinavian than I do, despite the fact that my paternal grandparents were FROM Denmark….and she has NO known Scandinavian roots in her 10 generation pedigree filled with early New Englanders and Palatines. Still think 23andMe makes the most sense, right now. We can certainly HOPE it gets better, Mary, but remember the limitations: we’re comparing to living people not historical populations. Sigh… I’m glad to hear I’m not the only one with disappearing Germans! As I said in Friday’s blog post (AncestryDNA begins rollout of update), there’s quite a bit to like about the new estimates and the amount of data provided is great. But all the samples in the world may never be enough to overcome the simple fact that we are looking at modern populations and trying to extrapolate backwards based on statistical analysis of what we think we know about the last three or four generations. Moreover, the public focus on these percentages as if these were the be-all-and-end-all of autosomal testing is so misplaced for genealogy. In most cases, these percentages don’t mean a thing in terms of what we really want from autosomal testing: cousins with the answers to questions we can’t answer! What is interesting is that Ancestry is using 300,000 AIMs up from 30,000 and the sample size has gone from about 3,000 to 4,245 and they have increased to 26 global regions. I woukd say that when they get to 1,000 per each global region then we will see a tightening up of the AIMs. Interesting that the Irish DNA Atlas Project needed eight great grandparents all born within something like 15 kilometers of each other. If that sort of thing was replicated across the globe then we would be getting somewhere. However the human diaspora is something we just don’t accept as if it is counterintuitive. Germans are probably among the worst since they were sometimes Germans and sometimes French and sometimes Dutch, sometimes Polish, sometimes Swiss and sometimes Austrian as in my maiden name line who were probably from the Caucasus and then Austria and then to Bavaria in the 1600’s and then to PA in the early 1700’s and then to VA, NC, TN then AL. And then not liking to stay put, appraently being in their blood they moved back up to TN then to MO and IA. And no they weren’t done yet. Then to Nebraska and out to Colorado and then to California! So if I had to assign a nationality what should I pick? And that’s just one line! Therein lies the conundrum. >> what should I pick? Mutt for me! Or Heinz 57 varieties! My DNA has not been tested in anyway, so I don’t have any horse in this race! But I am from France and recently studied my region of Lorraine during the 7 years war. The German Emperor used loads of Scandinavian troops to fight in that war and they ravaged that part of the country, as well as Alsace and many Lander in what is now Germany. Do you think there could be a correlation between that episode in the 17th Century and your DNA showing such a high percentage of Scandinavian ancestry? Just a thought! That’s certainly one possibility, Annick, along with the Hanseatic League sailors (both Bremen, my father’s birth city, and many Scandinavian cities including Stockholm and Bergen, were Hanseatic League cities so there was a lot of trade back and forth). But it points up the general difficulties of trying to extrapolate from modern populations back into historical time. I am studying to become a anthropologist; therefore I have taken several classes on the study of humanity. I agree with the problem with modern dna test results. People have always moved around the several continents since pre historic times and even before then. If you go back far enough the earth use to be one land mass and the people at that time have to have their dna in all of us. dna mutate over long periods of time, but we have people that are testing positive for Neanderthal dna(not included in 23 and me or Ancestry.com) Also, the way dna works, is that it tumble like the lottery, meaning that you et 50% from your mom and 50% from your dad, but each child does not get the same combination. Therefore we can get a lot of different results in members from the same family. We all have two ancestries. Genotype (hidden) and Phenotype (traits that are seen, like blue eyes. Just to clarify, Neanderthal DNA IS indicated in 23andme, just not in the admixture screen where the rest is indicated. It is under a different screen in Ancestry Tools. (And it has been there since my results came in in Feb. 2013). I take it to be the separation from the regular admixture is that perhaps that is more speculative data or because that 2.7% (in my case) cannot perhaps be easily sorted out from say my British or German or Iberian or whatever (and may overlap several admixtures). In other words, per my admixture which roughly equals 100%, adding the 2.7% would also be confusing to some as it would appear I would have 102.7% DNA. I assume also as well that some people might not take too kindly to hearing they have Neanderthal DNA, so this could be another reason it is separated out. But that is just an uneducated case on the why of that. I don’t have FTDNA as a comparison for how they do it. I have only tested at Ancestry (you are right, no Neanderthal or Denisovan there) and 23andme, but just ordered my dad’s y-DNA test from FTDNA to learn about my paternal Smiths. I have done no testing thus far at FTDNA or Geno. Not sure I will (besides Dad’s and perhaps husband’s y-DNA at FTDNA). If money allows, maybe in the future. Here is my info from 23&me on Neanderthal. Tried to copy the 23&me logo as further evidence, but it wouldn’t copy. An estimated 2.7% of your DNA is from Neanderthals. Just thought I would share that as some readers may not be aware of this and may wish to know. Is there really a difference in German, French or English ancestry? The royal family in England had cousins that were rulers in Germany and Russia. They looked very similar to each other. Don’t know if they were in the French royal family. My grandmother on my father’s side was part-German, but she was also part-Scotch-English. Some German words were still being used when I was growing up in the 1950s. There’s undoubtedly some difference, David — especially when you’re NOT talking about closely-inbred royal families. The real question is, what is the difference and can it be detected? Ok so I received my results from Genes For Good and it says I am 100% European! That’s it. No explanation, no certain area, nothing. I feel like the kid who got a bag of coal instead of a baby doll. Lol. I can sympathize about Raggedy Ann. When I was about 6, I wanted a Margaret O’Brien doll and Sears sent a generic baby doll! I’ve not submitted to DNA testing, but believe there is room for improvement in the interpretation of results. For the present, I have more known relatives than I can keep up with. 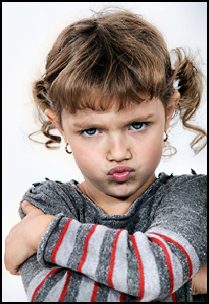 Sears… the bane and the joy of our childhoods! Sorry your results were not better. Both my new results and my father’s new results were close to our ancestry from our paper trail. Glad to hear you’re in the majority, George! Although I am no expert I have used genealogy DNA for 10 years in my small DNA project. It did help dispel one of our surname folklore that existed for over 100 years and created 3 distinct genetic trees for are not so common surname. We utilized FTDNA for this study but recently I also did a test at 23andme. Previously I also had the ‘FamilyFinder’ test at FTDNA and it was interesting but finding common ancestors is a challenge. Using results from both sites I did find a 4th cousin. Now I am trying to search a more difficult family tree surname back to N. Ireland. I am utilizing a case study from http://www.irishorigenes.com for the surname HENRY. The study provided more clues for searching Irish records in a geographic area for the pre-1850s. The case study did support some of my earlier guess as to where my ancestors may have lived. Now, to see if we can find any documentation to support the case study. I hope to attended your OGS webinar in Oct.
Looks like you’re making very good use of this new tool, Paul! Judy I love your columns and your work in general, but I hope you will forgive a cautionary note. We have always to be aware of the impact of historical migration / invasion / trade patterns and how they can impact ancestries. For example, among children of ostensibly Chinese ancestry there are occasional births in Hong Kong of red-haired children reflecting 16th-century Dutch heritage. If one does a bit of reading on history of the so-called Vikings, one sees that the “Rus” from present Finland had a couple of generations of strong influence and a small empire centered on present Ukraine before the 11th century CE, and their name is now reflected in “Russia.” Their taking slaves and selling them from the ‘Slavic’ population gives us our term ‘slave.’ The ‘Vikings’ from present Denmark, Sweden and Norway also had their own impacts, such as in Ireland, and as far as the Mediterranean. Then subsequently with the “Mongol” invasion of Europe as far as Finland, Hungary and Austria, came bloodlines from central and east Asia. So there are a number of ways one could get “Scandinavian” and “Asian” ancestries in comparison with populations with like heritage, regardless where their ancestors had lived in the most recent few generations for which paper trails are a lot easier than back to medieval and earlier times. As you yourself have noted, the genes kept by each individual from mtDNA will change as passed down over time, and it can be a fluke that one lineage keeps elements from Viking and/or Slavic heritage that may not be reflected easily in paper trails. Jade, you are absolutely right — which is why I’m NOT saying that these results are wrong. What’s clear is that we don’t know enough yet to know whether they’re right or wrong, and we may never be able to know enough. Don’t forget that the Swedes entered the 30 Years War and were a presence in Northern Germany. Also possible… but wouldn’t account for my Thuringen ancestors. The geographical composition of our genes will tell a very different story depending on how far back we go. This means someone will be 100% British (or US or whatever) in the last generation. 10 generations ago, you will be something else than 100 generations ago. Etc. etc. And it is still the same person. There were times like last glacial maximum where all people were 0% British or German or Czech. My own results say basically the same. My ancestors are 100% from South Moravia (Czech Republic) in the last 150 years, all speaking Czech, but they are from South Moravia and Eastern Bohemia in the last 300 years, speaking Czech and German. According to Genographic, I have 2% of Native American DNA next to 43% North Europe, 36 % Mediterranean, 18% SW Asian. (No wonder this is quite similar to German or British reference populations). My Y-chromosome is N1c1 and mtDNA is H3. While the outer lineages (mother-mother… and father-father…) tell me that I am basically something like Finnish-Basque, my parents have no clue their lineages lead to these nations and only speak Czech. Between those two lineages, I can be 2% Native American as some ancestors certainly came from Siberia 10,000 years ago or more (N1c1 confirms that). It all depends how far we go and we get a different results and it would still be correct I think. You are absolutely right about that, Karel, and I think that underscores why we can’t take these numbers all that seriously. At least not yet! Not to mention that before 1620,,English and Spaniard’s were coming over here stealing natives from the new world and taking them back to Europe as slaves.I also found out about some infidelities within my immediate family that I never believed it would have happened since my folks were supposedly very good Christian’s.My paper trail goes to William the conquer.All my life I thought I was mostly British till the line went further into France.Just about all my English lines changed in the 1400’s to French,I recently took the ancestry dna but dont have the results..hey why dont they exhume some of the bones from then to get actual readings? They did it on one of our presidents. The movements of the Swedish army during the 30 years war were not confined to northern Gernany. The Swedes ranged through Saxony and also touched Thuringia. Several major battles took place in the area. So don’t discount the possibility of Swedish ancestry. I’m not ruling it out — but the YDNA haplogroup of E-V13 makes it less likely that the Thuringen line was Swedish. Not impossible, just less likely. These percentages are really only valid at the continental level. It’s relatively easy to distinguish between Europe and Africa — not at all easy to distinguish between continental Europe and the British Isles. I am of 100 Irish descent. However, Genographic 2.00 had the UK as my reference country. The largest country in Central Europe is Germany. Although Alcase-Lorraine is in France, the people are of Germanic origin as were the Franks who crossed the Rhine River and blended with the Gauls who were a Keltic People. As to the Scots-Irish, the Great Lord Wellington, a fair man who gave civil rights to the Irish people, had this to say about the Scots-Irish. “They are Little Scots and Less Irish”. The original inhabitants of Scotland were Picts & Caledonians who most probably spoke a “P” Keltic language such Breton. The Scots were from Ireland who crossed from Ireland and eventually became rulers there. The language then became the “Q” Keltic Scots Gaelic. In a certain comedy film King Arthur said WE ARE ALL BRITIANS. He might also have said WE ARE ALL KELTS. I’ll go along with the all Kelts bit, Tom, since it’s a sure bet we’re not going to get much better info without digging up a lot of very old skeletons! I received my test results today and always thought I was 100% Greek (with various invading country DNA), but was very surprised to see my results state 40% Greek/Italian, 29% Great Britain, 12% Middle East, and 10% European East. The 29% Great Britain was the biggest surprise because my mother’s side traces back to the Ottoman Empire (town south of Istanbul) and my father’s side was from near Tripolis. Both sides have blue and green eyes plus my dad was blond as a child. My brother and sister have fair skin and light eyes, but I have the darker features along with rosacea. I know Constantine (last Roman Empire who converted to Christianity was from Constantinople (now Istanbul) plus he was the Princippia of York at one time, so maybe my relatives traveled with him? Crusaders past through the area, too. There are all kinds of possibilities for contributing to that mix, for sure, plus the possibility that the analysis is just plain wrong. I thought I was 100% German but my results from ancestry came back 50% Scandinavian and 5% German. I don’t understand my results. How did DNA from Scandinavia get mixed with German DNA? Through the Vikings? I have a family reunion coming up in a few days and I need to be able to explain this. Anyone help me? I’m also 3% Irish. Thanks, Cindy K.
The percentages are essentially cocktail party conversation, not scientific analyses of your ancestry. At the continental level (European versus African versus Asian), they’re great, but science can’t really distinguish between German and French (or Scandinavian). Hello, I received my ancestry D N A result a couple of weeks ago and was a little disappointed with the result. 47% Irish, 46 G B, 6 Scandinavian, and two trace of east Europe and Iberian peninsular. My disappointment lies in the fact that G B cover Wales and Scotland. Two very different countries. My fathers family goes back into the mists of time in Ffestiniog in North Wales. I understand from the recent D N A project ” Who Are The Welsh” that the D N A in the North of Wales is very different to the South and also to the British main land. Also my third cousin had her result a few weeks back and it is inexplicable. Her ancestors on all sides are Welsh yet she only has a trace 2% of G B. I feel that her result has to be wrong. Wales and Scotland are different to G B and I feel that U S see wales as a village which is not the case. Not not not not soup yet. Can’t say this strongly enough or often enough: ethnicity estimates are little better than cocktail party conversation. Hello, Judy and thank you for your prompt reply. Here in England we pay one hundred and twenty pound to have ancestry do these d n a tests. I really feel that I have been had. My family bought me the test as a birthday present. Ref the Ffestiniog ( N Wales ) d n a. This part of Wales is remote with high mountains on all sides. G B result just does not cover this area. Thank you once again. I wish that I had found your site before I did the test. The point is that they no longer are counting me as Central European. At all. My Germans have completely disappeared according to the current testing. First let me say that I am new to the DNA portion of Family research and I really appreciate your work on behalf of all of us ..
Just got my results back from Ancestry today (30 January) .. After waiting since November of 2015 .. They couldn’t locate it or something until I contacted them asking when I was going to receive my results .. They did not know why the delay but they would look into it .. Then last week they said all was in order and in motion and it would be out to me soon .. As I Said it came today by email. 1. I can understand somewhere along the way a Greek and/or Italian person being a member of our family tree, Not an issue .. However how does 17% happen when we show no one in our tree anywhere .. My question is the 17% figure .. From where do they get such a “high” figure considering the possibility that even a few would be in the tree .. 17% just seems to be a high percentage.. It would seem that to get this figure “a group” would need to be involved in our tree and it would seem that this group would stand out somewhere along the line..
2. How far back does “Their” research go .. Since through our own research we are really almost complete back to the early 1700’s at this point with no one of Greek or Italian heritage found. Thanks for your help … Any enlightenment would be greatly appreciated. You need to disregard those blasted percentages. They’re not particularly useful, and not particularly accurate. Please read, among other posts on this topic, Those pesky percentages and Admixture: not soup yet. Bonnie, Could be that the Roman Empire had something to do with it….there are ruins remaining in places such as northern Switzerland and I’m sure other countries too. Perhaps the Mediterranean influenced that percentage outcome. It seems the ancestry is not necessarily contained within political borders, but rather people groups. Yes? Hello, Ref Bonnie of above message. I read your message with interest as your surprize percentages are so similar to the result of my cousin. Please see my message of above. Jean who has Welsh and G B ancestors back into the mists of time ( G B covers Wales ) has only 2% G B. This cannot be correct. Judy is right when she says to disregard these percentages. All the same we do pay a lot of money to obtain these results and one would have hoped that the companies offering these test would have refined them somewhat before rolling them out. I glad to find this, as my ancestry.com DNA test also came back with ZERO German, though there’s no question of my numerous German ancestors. My test also showed only Scandinavian. This caused me to have to research why this could be, and look at the areas in Germany my families came from, mostly Baden, then read up on history as to why people of that region might be of Scandinavian descent. Geez, couldn’t ancestry just explain this, instead of causing more confusion? For a test that cost 100$, I don’t think that’s much to ask. I think it’s interesting to understand that my German ancestors descended from Vikings, or whatever, but to not explain that this doesn’t mean they weren’t Germans, who lived for centuries in Germany, is pretty dumb, when the goal is to create better understanding. Perhaps even more ridiculous is that my grandfather came from a tiny hamlet in the Italian Swiss alps, of about 500 people with families that lived and intermarried there for at least hundreds of years, in fact, my great grandparents were even 1st cousins, yet the DNA test showed only 12% Italian. I feel that except for broadly confirming what I already knew, but first leading me to question and wonder about it, the test is pretty much falsely advertised and certainly not explanatory. I will say that it confirmed that I’m not Native American, which some relatives insisted but I couldn’t find anywhere in research. I sincerely doubt that Viking raiders are the explanation of the high Scandinavian results. A problem with the reference populations is far more likely. It’s all a matter of comparing living people to living people, so it’s never going to be all that good in terms of results. Two siblings can take a dna test and be totally different from each other.It depends on the DNA you get from each parent.You may have not gotten the Engish and more of the other.England is also a mixture of people from migrations.They have German, French and other mixture.Your dna maybe showing more of this. 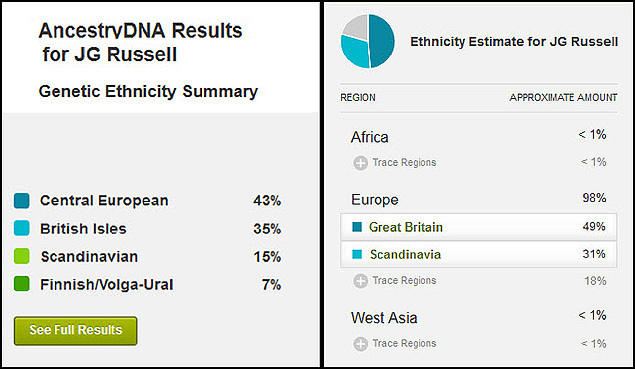 I took the DNA test and I inherited my Fathers DNA 51% Europe West & 27% Irish/wales/Scot from my Moms side. 10% Britian. I don’t have Europe West complexion and eyes. I have the very light skin and green eyes from my Irish ancestors. I thought I’d would have more Irish DNA as my Great Grandpa was from Ireland on my Mom side and my Dad’s people were from France & Germany. You’re confusing genotype (what your genes say) with phenotype (what you look like). The two aren’t necessarily going to match up all that well. Hello, due to an admin problem with ancestry D N A. My sister was tested twice within a week. We were told that her first sample would be deactivated. To our surprise she got a result for both samples and matched as a twin to herself. No surprize there. We did noticed that her first test sample gave her 49 G B and 46 Irish, 1% Scandinavia and four %Iberian Pen. The second one 49% Irish, only 45% G B,2% Scandinavia and the same 4% Iberian. Very small discrepancies but never-the-less these are samples from the same person. These tests were taken in June of this year 2016. I would have expected them to have been have been exact results. “No, certainly not soup yet. I also was surprised with my DNA results in Ancestry. Even more surprised by my mother’s. I have an extensive family tree that goes back into the 1600s. My mother and all of her forbears were born in England (and most of them were born within 50 miles of Bow Bells). However, her DNA results came back with zero Great Britain ancestry. So my question was what is going on? Mine came back with 9% Great Britain despite the fact that my family tree indicates that 75% of my forbears were born in England (my father’s father and his descendants were born in Lincolnshire and Yorkshire as far back as I can go). I have a 12% Scandinavian match and 64% Western European. Could it be that the Anglo-Saxons are considered Western Europe and not Great Britain? Could it be that the Normans and Danes and other Vikings are considered Scandinavian? And 8% Iberian Peninsula – I’ve read that they were the first seagoers many many thousands of years ago who landed elsewhere in Europe. So would that stand to reason that the only Great Britain genes are those that derive from the ancient Britons prior to the arrival of the Iberians, the Romans, the Anglo Saxons and any other groups of people since then? Comments anyone? Only to repeat what I’ve said time and again: it’s not soup yet. I received my Ancestry DNA results December 17, 2016. From the paper trails I would have expected roughly 50% Western Europe (based on German ancestors with a smattering of French) and 50% British Isles/Irish. Instead it came back 57% Great Britain, 19% Scandinavia, 11% Europe East, 7% Europe West, 3% Ireland, and a smattering of other areas totaling 3%. (Good news on the results was that as would have been predicted based on paper info, no Native American or African American.) The high Scandinavian percentage, having to be attributed to Viking incursions because I have no known ancestors from those countries, has led me to do a lot of on-line investigating into the areas my ancestors came from. On my father’s side, oldest records have the first recorded ancestor moving from the Glasgow area in 1612 to northern Ireland (County Antrim, near today’s Belfast), intermarrying for a few years and then moving to Pennsylvania in 1723. The Scottish/Irish areas could have been invaded by Vikings at one time. That family in PA then intermarried primarily with families with English backgrounds, including one which located to Massachusetts in the 1600s from Dorset, England which had a heavy Viking presence. My dad’s mother moved to the U.S. as a small child around 1890 from Aurich, Germany. But this area (Lower Saxony, side-by-side with Frisia) again has a very heavy historical record of Scandinavian incursions. On my mother’s side, her father’s grandparents moved to Wisconsin in the 1840s from Cork, Ireland–an area shown on the maps as a Viking outpost. Her mother’s grandparents moved from Thuringia, Germany to Wisconsin in the 1840s. As noted in some earlier comments, there is a possibility of a Scandinavian influence there during the 30 Years’ War and I need to check that out. Overall, I would say that keeping in mind this is still “soup in the making,” the results have given me interesting avenues to think about, research, etc. I am beginning a 10-week (30 hours) adult ed class next week on Genealogy and Genetics and am hoping to pick up additional insights about DNA ethnicity results and comparisons among the three major companies. I’m keeping an open mind! My open mind suggests that Ancestry is having trouble distinguishing German from Scandinavian. Everyone from GB confused about results – read up on history of migration of Angles and Saxons to GB, on Viking invasions especially “Danelaw” and on Norman conquest researching also where the Normans came from before they settled in Normandy (hint: Norman meant “north men”) – You will find Scandinavia. Lots of it. Except for one minor little detail: some of us who are confused about the results don’t have enough British ancestry to account for what’s being reported as Scandinavian. There is still a fair amount of continental European ancestry, particularly German and French, being reported as Scandinavian. My AncestryDNA results are 35% Italian / Greece, 28% British, 17% Eastern Europe, 9% Caucuses and the rest a mix of Western Europe and other trace elements. My known ancestry is 100% Italian on my mother’s side, and a mix of German, French, Czech (Bohemian) and British on my father’s. The gedmatch calculators treat me like a European mutt. I get plenty of Italian, Germanic and British Isles, but also a lot of Hungarian, Romanian, Bulgarian, etc., of which we have no known ancestry. Interestingly, the Sicilian village where both my maternal grandparents were from has a strong Norman influence. Many on my mother’ side were blond and blue eyed and all were very fair skinned. (My grandmother was often mistaken for Irish). My example probably highlights the limitations of these tools. They are getting some things right, but it looks like the averaging that takes place is probably putting me into some buckets that aren’t accurate. My DNA results came back and were 95% Great Britian and 5% other. I had never seen or heard of anyone having such a high ethnicity %! I have lived in Arkansas my entire life. From the tree Id been working on I had already assumed a Scottish lineage from both parents on my fathers side: Stewart/Stuart and Cooper/Couper. I dont have as much filled in on my mothers branch. 95%interesting huh? We have something in common.My father is a Cooper from Arkansas.I also have Stewarts in my lineage.My Coopers/Cowper/Couper are originally from Scotland before 1450.My ggf migrated to England and was there for about 100 years then to America.Stewarts of course are from Scotland.Your GB dna covers Scotland Wales and Northern Ireland.Because of celtic dna they can’t separate Scotish dna from others.Actually the Scott’s are originally from Ireland so thier dna is so close they can’t separate them.So your Scottish dna will show up in GB or Irelands.You need a tree to go along with your dna to tell your story.PS I’m wondering if we are not cousins. My tree and dna are a very close match.You have to go back far enough to see all your ancesters.In 1700 all my ancesters where in America already.From what I understand that Ireland Scotland and Wales are Celic so their dna are very similar.You need to do a paper trail to find out which.You can also go to GedMatch and down load you dna for free and they give you more info then Ancestery. You’re missing the point: as long as living people are compared to living people, the analysis is only as good as the reference populations. If those are not adequate, you can do your paper trail until the cows come home and the analysis is still going to be wrong. Wouldn’t that suggest that very interesting results would come from the ancient calculator tools? I find it fascinating to see where my ancient ancestors were from, long before countries as we know them existed. with dna and a little research you may find your answers.If you go back far enough you may find your German ancesters really are French.My ancesters have been here since the early 1600s but I’m 100% European.With those 3 things you can connect the dots and find some surprising things about you heritage .OR maybe I’m just one of the lucky ones whose dna and tree match. I can find even the trace amounts in my tree.You need those things to tell the story. Paper trail research has nothing to do with the accuracy — or lack thereof — of the reference populations being used for ethnicity estimates. Some people who have little admixture will find the results perfectly fine. Others will not. It’s the fact that everybody can’t rely on these now that’s the issue. I did my tree first and was shocked I wasn’t what I was told all my life.But my tree and my dna tell a story that I believe.You just have to look at both to get the story.Also to realize some dna can’t be pin pointed to one race.Like the Scotish and Irish they are just to similar in make up because they are closely related.My dna says I’m Irish but I’m Scottish.But a 1000 years ago they were all Irish.Also my ancesters were in Northern Ireland (Ulster and Plantation)before they came to America.I also show Wales and Cornwall in my tree but it is part of my GB.Gedmatch shows these in my dna. This is for Tamara E.My father side are Coopers from Arkansas and they are from Great Britian but I found thru my tree the are originally from Scotland before 1450.I also have Stewarts who are from Scotland aswell.Scotland is part of the Gb dna along with Ireland. Thanks so much!! If youd like to share your email Ill send you some screen shots of my tree! You maybe right on that because I’m 60% British (English, Scotish,Welsh and Cornish).Which probley have very close dna.The rest is German, French and Dutch which is in the same region. I’m just suggesting that there maybe other reasons that people are disappointed in the DNA results other then inaccuracy.Maybe with a little digging they may find what they are looking for. Your position is abundantly clear. And we should move on already yet, no? Can’t help without knowing what you’re confused about. Part of the problem is that users are expecting a higher degree of specificity than is actually possible. While there is a fairly high degree of accuracy between European/east Asian/African ancestry, beyond that it gets much murkier. Neither “Great Britain” nor “Scandinavia” is an ethnicity (and Jewish certainly is not), and the genetic differences between the average Caucasian resident of all the countries in northwestern Europe in 2019 are negligible.